Ever since I became interested in technology for the legal profession, I’ve been looking for two specific types of software that matched my expectations. The first, case management solutions, have been attacked from all angles, and I’m convinced they’ll get it right soon. The second, well, I really want someone to come up with a system that can organize my damn contacts! Something short of a full CRM system (particularly the price point), yet more than what most contact books offered. Ever since it’s acquisition of the mobile contact app Cobook, FullContact has been getting rave reviews for its contact management system – along with a few million dollars in venture capital funding. So I took it for a month-long test drive, to see how it would work for lawyers. Essentially, FullContact helps with two primary components of contact management and address book organization. 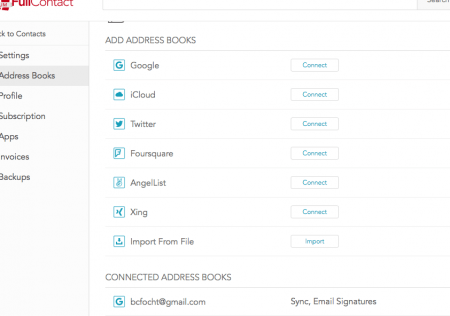 First, it combines address books from a number of sources, so all of your contacts are in one place. Then, using the information you’ve added to your contacts, FullContact helps you to combine your duplicates and keep your contact information up-to-date. FullContact combines various contact books and social media accounts into one list – your “Unified Contacts.” In Unified Contacts, FullContact intelligently merges, de-dupes, and supplements information from public data sources on your contacts, looking for any new information to keep your list current. Basic information is automatically added, but additions or changes that FullContact isn’t so sure about, it’ll run by you. FullContact is available via several different tools. The primary platform is the web-based platform, but it syncs in real-time with iOS and Android apps, as well as a Mac app. It also creates daily backups, just in case. The FullContact system has some really nice features, and it’s system of intelligent analysis and de-duping is something that could be really valuable for any attorney. Assuming it works. However, experience teaches me to make sure that the app is capable of handling the basics first. 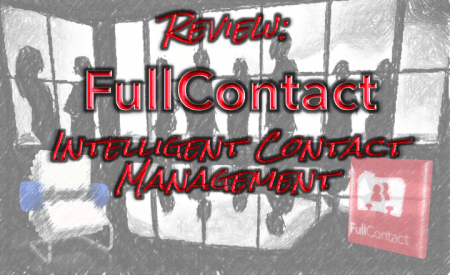 With one glaring exception, FullContact performs remarkably well. 1) Creating/Importing Your Contact List. For me, no contact management system can truly be complete if it doesn’t provide considerable and robust options for each contact. Most of the basic systems that come standard with computers, tablets and smartphones tend, in my opinion, to be lacking in this area. The lack of options even extends to systems I would expect to have more, like those of the cloud-based case management systems by Clio, MyCase and Rocket Matter. If not for one major missing item, FullContact pulls it off. All of the basic information that I want to add has a dedicated field. Email and phone number options are extensive, and include a “Custom” entry that allows you to name it as you wish. Video conferencing systems have their own field, with a list of popular options already included. Where you will be extremely impressed is in the “Website” or “Homepage” field. Only four options are listed. Until you hit “Custom,” and enter the name of a social networking site. As you’ll see below, nothing short of amazing. Additionally, the “Relationship” field allows you to add any number of pre-listed relationships, such as Mother, Father, Friend, Spouse, Assistant, Manager. Again, the “Custom” section can be utilized to add things like “Paralegal” or “Referral Source.” Key for a lawyer’s networking. There are also several different import options, allowing you to bring in contacts from your Gmail account, iCloud, your phone, your computer, a whole host of social media accounts, and, of course, the trusty “import from file” option. Not every part of the contact creation/importing system meets my expectations. The glaring omission is that you are not able to designate a contact as a company. Nearly every contact management system I’ve used allows you to create entries for businesses, including the factory installed Address Book on my Mac. At present, there are no plans to include such a feature. Additionally, you’re not able to directly link contacts together. Entering a name in “Relationship” or “Company” only creates a search term, rather than a link. Probably sufficient for most searches, but a little more thought would dramatically increase the options. While the first category is largely met, the omissions I’ve discussed are significant, particularly for anyone using this as a CRM-like platform. While some of the functionality can be replaced by using the Tags available, they will get cumbersome, and tend to defeat the purpose of a contact management solution that self-updates. 2) State-of-the-Art System for Updates. When you add a contact to your Uniform Contacts, FullContact uses any “unique” information identifiers (e.g. websites, blogs, phone numbers, and email addresses) to search publicly available records for the most current information on the contact. 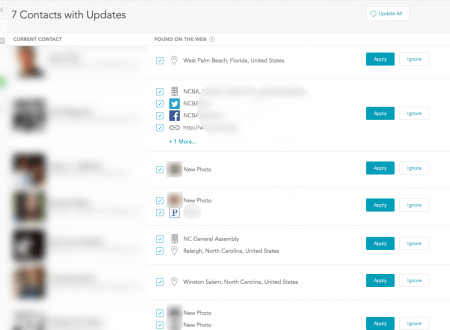 You’re also able to link your contact to any of over 100 social networks. Any changes to publicly available information, social profiles, or email signatures (if you’re using Gmail), and you’ll be prompted to update the contact information on your home screen. Just a small example of the types of items that FullContact will add to your contacts: websites, addresses, social media profiles, job titles, and more. While all of these updates and the Unified Contact list is incredibly nice, there’s definitely a price to be paid. Since you’re not able to designate companies separately from people, your list is going to get mighty crowded, and it’s not easy to manage. Moreover, those businesses tend to not have the “unique” identifiers, and as a result, don’t get updated very frequently. Another problem: no matter what you do, FullContact simply does not combine all the duplicates, mis-identifying a few along the way, too. Additionally, once you get to more than 400-500 Unified Contacts, which is definitely not out of the question for lawyers, technical issues abound across all platforms. One click while something is loading, one hiccup in your internet, and the work you’re doing on the “S” section of your list resets up to the top, and has to re-load the entire alphabet up to that point (because you’re not able to reverse the alphabet search or simply start at a particular letter). All while consuming most of your computer’s resources – oftentimes more than 1/4 of my MacBook Pro’s available memory. However, even with the frustration of messing with duplicates, no one can deny how awesome the contact update feature is. Users of the free account will see updates done once per week, while paid users will be updated once daily. 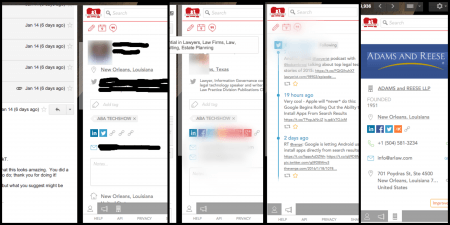 3) Connecting FullContact with a LOT of Social Networks. There is a lot of good information on those social networks, and as FullContact searches the web for your contacts’ available information, it’ll add new social profiles that it finds. For those of you using FullContact to create and increase your referral network, that information will really come in handy. Unfortunately, some of the more successful social networks have been pulling back on the amount of information they share for free. The biggest issue as far as FullContact is concerned is with – surprise surprise – Facebook, who only allows you to import your friends if they also use FullContact. 4) Relying on Tags and Advanced Search to connect Contacts. Since there is no way to designate a contact as a company (other than leaving its name blank and listing its name in the Organization field – which if you try, you’ll see creates its own headaches), there’s no linking companies to their employees. I find this particularly irritating from a CRM or networking perspective. To me, it’s crucial to be able to link contacts together – so I can see all the contacts in my book who work for Allstate, or so that someone who refers someone to me gets linked to their referral (for better or for worse). Moreover, the ability to view a company hierarchy is pretty important too. 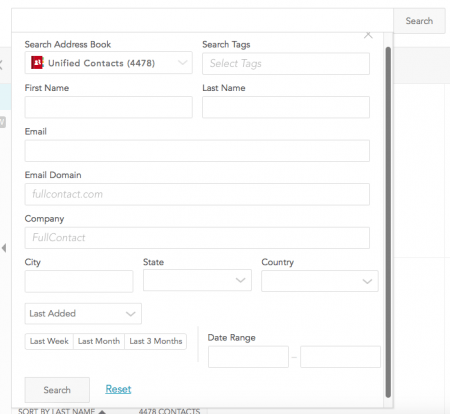 FullContact’s alternative is to either create Tags for all the businesses and categories you want – in my opinion, this is simply not realistic, because it’s too hard to tell who has been tagged without opening every individual contact – or to use Search. I will say, the search feature is pretty effective, and advanced search allows you to search by Organization. But your contacts better have the company listed, and it better not be out of date (because of all things, their previous jobs will remain, out of order, on their contact info even when FullContact itself updated their job). This, to me, is one of only two serious issues that FullContact has (the other being some maddeningly frustrating technical problems that appear to include all platforms), but it is a big problem for anyone looking to FullContact as an option for CRM or networking. Aside from the company problem, the other tools for facilitating networking are, well, amazing. This picture doesn’t do it justice, sadly. You get your basic contact info, and a lot more. Leave notes on your contact’s page without leaving the email, get information on the contact’s company (information curiously unavailable in the primary FullContact Web Platform), and even see your contact’s most recent Tweets. Oh, and don’t forget that they have a Business Card reader app too. 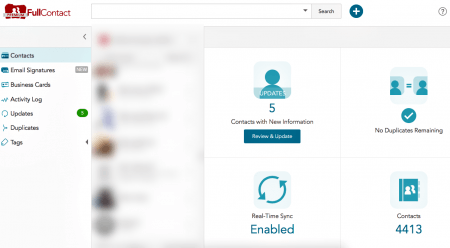 Key Feature: FullContact’s Intelligent de-duping and updating your contacts information based on publicly available information and their social media profiles. Fatal Flaw: Tie between technical glitches that severely hamper use once your Unified Contacts exceeds 500 contacts and the lack of ability to designate a contact as a company (and link its employees). Overall, FullContact is an amazing contact management program with absolutely unique tools for making sure that your contact list is up-to-date. However, it’s impossible to overlook the glaring weaknesses that prevent FullContact from truly being a potential option for lawyers to use as a basic CRM platform, and even has some gaps that would be difficult to fill for networking. Without the usefulness as a CRM platform, can you justify spending $120 per year just to keep your contacts’ social media profiles straight? I’m not sure. Thanks for the excellent review. The inability to list companies,and in my practice, case names, as contact entries, makes this program a non-starter for me. Yeah, I’m really trying to find a system that provides the kind of organization and updating features that FullContact offers, and some of the basic CRM capabilities like linking companies and other contacts. I’m not wild about paying $50/month for a CRM system, but there’s just really nothing in between that I’ve been able to find. Hey Brian – Thanks so much for the detailed review! You raise some excellent points, and I’d love to discuss them further. 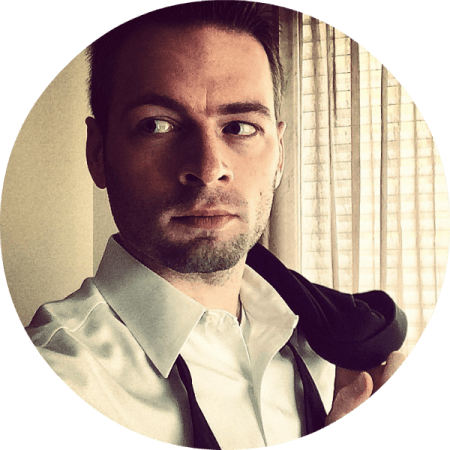 As the Head of Product at FullContact, I’m always looking for ways to improve our product. I’ve sent you an email – would love to schedule some time to discuss. Let me know! should you need more input I am available I like your review, Full Contact could be super awesome with some changes. Right now it is an impressive address book but needs Contact management features. 1. I agree linking contacts and Company comments are needed. 2. Ability to shedule a follow up call etc this could then go automatically to google tasks. 3. When inputting notes ability to insert time and date stamp. 4. Ability to add additional files or pictures to contact ( of course this wont be able to sync over to google contacts but will be in Full Contact all the time) 5. 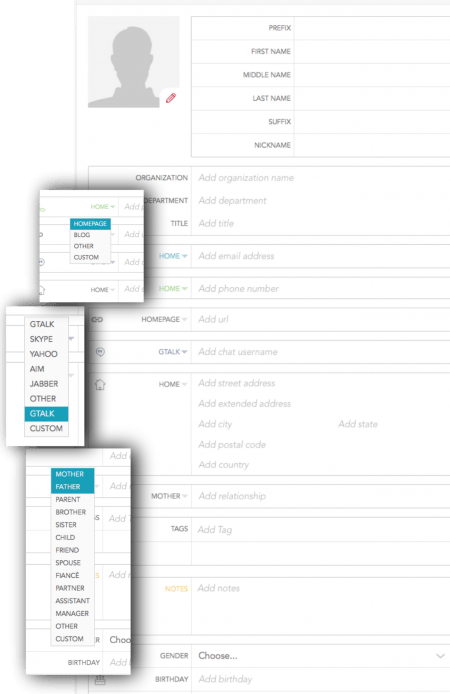 Ability to set up an email merge for your groups or selected contacts. I have yet to find a product that has all these features in a good looking easy format. I think Full Contact could achieve this and I would be willing to pay for the services. I like your review, Full Contact could be super awesome with some changes. Right now it is an impressive address book but needs Contact management features. 1. I agree linking contacts and Company comments are needed. 2. Ability to shedule a follow up call etc this could then go automatically to google tasks. 3. When inputting notes ability to insert time and date stamp. 4. Ability to add additional files or pictures to contact ( of course this wont be able to sync over to google contacts but will be in Full Contact all the time) 5. Ability to set up an email merge for your groups or selected contacts. I have yet to find a product that has all these features in a good looking easy format. I think Full Contact could achieve this and I would be willing to pay for the services. Thanks for your feedback! I’ll share this with my team for future feature consideration. Full Contact is a joke, you think you can “intelligently” pull information off the internet and blindly merge it with someone elses database? Who vets this information? (hint, NO ONE) Who confirms this information? (Hint NO ONE) If you want to piss your clients off, send them an email that has unverified data from the internet blindly merged with it. Full Contact, it’s the best way to loose a client invented yet . . . . . The closest I’ve found so far were Kylook (but not all fields are searchable there) and OfficeClip (where custom fields are not synced and permission settings are a bit messy). Does anyone know of a solution that would meet all these requirements? Thank you in advance! A four star review of this product must be paid, because FullContact deserves zero stars. I set up FullContact for my business with the goal having a fresh clean list of prospective clients. This account was only synced to my business email account, and I gave no permissions to link to any personal accounts, google, iContact, or otherwise. I then set up a completely separate personal account synced to my gmail. The purpose of this was to manage my personal contacts separately, and it was never connected to my biz account. However, by opening my business account on my laptop, it not only auto-synced all of my personal contacts without permission, but also pulled in my iContacts without permission as well. I have tried to unsync and FullContact will not allow it, and I have been dealing with a completely daft customer service person there who has gone back & forth with me for the last two weeks and never managed to solve the problem. FullContact is the worst product on the market. It will sync your contacts without permission, thereby giving your employees access to all of your personal information.